Mogpog River is located in the island of Marinduque, Philippines. It used to be a relatively healthy river where local communities dotting its banks from Barangay Taluntunan down to Barangay Janagdong obtained fishes, crustaceans and other aquatic organisms. Harvesting these resources were either for local consumption or for cash. The river also served as a place for bathing, swimming, washing clothes and for farm use. In the year 1967, Marcopper Mining Corporation, a subsidiary of Placer Dome which owns 39.9% of the corporation in the Philippines (Philippine Indigenous Peoples Links, 2003), started the construction of the copper mine. The company commissioned Tapian Pit in 1979. Later, the San Antonio Pit was also opened in the 80’s to contain mine wastes. This pit served as the waste rock dump while the former pit as the tailings dump (Oxfam Australia, 2003). However, villagers complained of fish-kills and foul smells being emitted from the river especially after a heavy rainfall (Coumans and Nettleton, 2000). In 1991, an earthen dam was built at the Maguila-guila Creek, the headwater of Mogpog River to hold back the tailings which is accumulating fast in Tapian Pit. In December 6, 1993, Maguila-guila dam collapsed, causing floodwater and contaminated silt to race down the Mogpog River. Then, in the year 2001 Placer Dome left the Philippines (Oxfam Australia, 2003). During the 1993 dam collapsed, about twenty-one (21) barangays in the Municipality of Mogpog were buried in mud and toxic floodwaters. Agricultural crops and various household items and merchandise were swept away by the swiftly moving mud (Asuncion, 2001). The raging water also swept away aquatic organisms and destroyed human habitations along its path. Farms were also covered by mud (Coumans and Nettleton, 2000). On August, 2000, researchers of INECAR visited Mogpog and confirmed the phenomenon of Acid Mine Drainage (AMD) occurring in the river. It was also observed that contaminated water drips from the dam into a tunnel just below the dam and allowed to flow into a canal connected to Mogpog River. Because of the acidic condition of the river, the local government provided a footbridge where the people can safely cross. The damage to Mogpog River and the local communities within the vicinity of the river was huge and its impacts are still being felt even ten years after the dam collapsed. For instance, a former productive ricefield in Mogpog was abandoned after the dam collapsed in 1993 because it could not anymore grow crops after it was covered with silt coming from the dam. Only few patches of grasses dot some parts of the land. Figures 1a and 1b show the condition of the abandoned ricefield in Mogpog. On June, 2004, a study on the sediments and biological indicators of pollution was conducted in Mogpog River by a team from the Institute for Environmental Conservation and Research (INECAR) of Ateneo de Naga University. Another team for the water quality analyses, organized by Dr. Alan Tinggay from Australia, joined INECAR. Funds were provided by Oxfam Australia. This report however will only deal with the INECAR study. A separate report for the water quality was also prepared by Dr. Tinggay (2004). The purpose of the present study is to find out the extent of the damage resulting from the past mining operations of Marcopper Mining Corporation. The researcher intends to relate acid mine drainage (AMD) already occurring in the area with the biophysical condition of Mogpog River. Specifically, the study focuses on a) heavy metal contamination of soil along the riverbanks; and the b) effects of AMD on living organisms through indicator species. Data gathering was done in June 18 to 21, 2004. A second trip was also conducted in September 12 – 14 of the same year to validate some of the results obtained from pollen grain analysis of an indicator species Stachytarpheta jamaicensis. In addition, phytoplankton diversity was included in the study due to the presence of some species in the acidic portion of Mogpog River. In this research, two study sites were covered: a) Mogpog River and b) Dawis River. The latter served as a reference river and considered as the control site to ascertain that heavy metal pollution did not happen naturally but as a result of mining activities. It also provided the bases for determining impacts on soil and on two biological indicators. 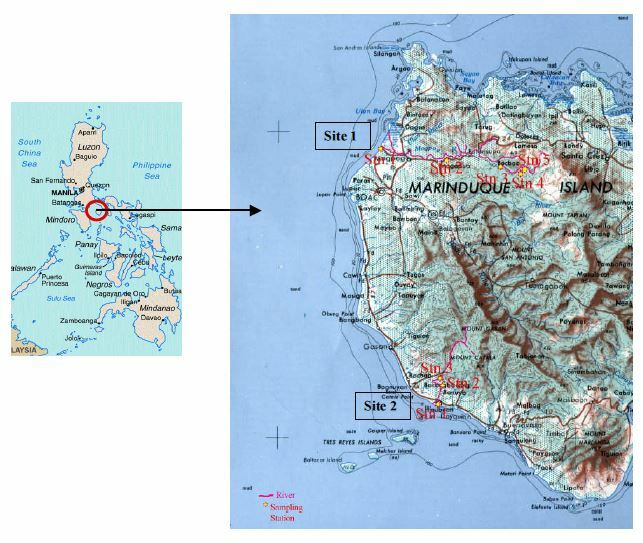 Figure 2 shows the location of the two Study Sites in the Island of Marinduque. Figure 2. Sampling Stations (Stn) in Study Sites 1 (Mogpog River) and 2 (Dawis River). Note the steep terrain of the island clearly shown in the PCGS map from NAMRIA.A legend is provided at the lower left of the map. A location map of Marinduque is shown at the left. This portion was made through vegetational analysis involving weeds. Weeds are good determiners of similarities between two or more areas because these plants are cosmopolitan in nature and they have the ability to thrive in a variety of environment including highly disturbed ones. In this method, the weed composition of two sites was compared in terms of species richness using Sorensen’s Coefficient of Similarity (CCs) as published in Brower et al. (1990). A value of above 50% species similarity based on Regis and Lagunzad (2002) considered the sites as comparable. The 50% limit was applied in consideration for the likely magnitude of the disturbance such as what happens in many mining sites where disappearance of species is a normal occurrence. In order to discount the possibility of deviating too much from the local conditions, the sites have to be located in the same island, facing the same cardinal point (north, south, east or west) and that normal human activities conducted are also similar except for the activity in question which is mining in this study. Species determination is normally by the presence of flowers. In the absence of such feature, the gross structure becomes the basis and this includes leaf forms and type, stem (herbaceous or woody), clustering appearance, growth form, and other features that can show that the plant is a different species from the others already identified. The results of the vegetational analysis on weeds showed that Mogpog River and Dawis River are comparable by 59.7%, thus, Dawis River could be used as a reference river for the study. It was also observed that more weed species are found in Station 1 (mouth) than in Station 3 (Barangay Bocboc) along the banks of Mogpog River. A table comparing the weeds thriving in the riparian habitats of Study Sites 1 and 2 are presented in Annex 1.
c) Phytoplankton samples from 1 sampling station (Station 3) within Mogpog river and 1 sampling station at the mouth of a tributary for comparison. One composite sample from 30 randomly collected 1-kg soil samples were obtained from each sampling station in each study site. The samples were collected from two locations: a) at the water edge of the riverbank, and b) from about 15 –20 meters away from the water edge. These samples were obtained from 20 cm below the soil surface. The composites were air-dried and then brought to the University of the Philippines Natural Science Research Institute (UPNSRI), Diliman, Quezon City. Chemical analyses of the soils were on arsenic, lead and cadmium content. The method of analysis was by Atomic Absorption Spectrophotometry (AAS). 1) People complained of darkening of skin on toes when they regularly cross the river and suspected that this may be due to the presence of arsenic (As). 2) Published literatures show lead (Pb) in blood samples taken from affected children residing near Calancan Bay. 3) Cadmium (Cd) was chosen because it is a natural constituent of copper and gold ores in sulfide rocks and because of its property of being easily absorbed by plants. Other metals were not included due to limited funds. The presence of Copper (Cu) at above the natural level was assessed based on other studies such as those of Dr. Alan Tinggay (2004), the USGS-Armed Forces Institute of Pathology report (May, 2000), an initial investigation conducted by INECAR of Ateneo de Naga University (Regis, 2002) and the results of chemical analyses on arsenic, cadmium and copper for the indicator species Stachytarpheta jamaicensis in this present study. In the initial investigation conducted by INECAR earlier, an acidic blue water was observed in one of the braids of channels of Mogpog River. This indicates the presence of copper sulfate (Vugteveeen, http://www.elmshurst.edu/~chm/vchembook/334raymine.html). Tailings spills that happened in the area would possibly contaminate the soil and sediments with significant amount of this metal. The water quality assessment by Dr. Alan Tingay contained in the Marinduque Scientific Report show elevated levels of copper in the dam and some stations downstream. The USGS-Armed Forces report by Plumlee, et al. (2000) also mentioned high levels of copper in Mogpog River. D. Other parameters measured were soil pH and characteristics such as soil color, soil texture and drainage potential. Soil pH was determined using the method of Heckman (1994). An average of three readings were recorded for each sampling station per study site. Soil type was determined by the Hand method (DeLuca & O’Herron, 2002). Thirty flower buds were collected from an indicator species Stachytarpheta jamaicensis (Figure 3a) in each sampling stations of both study sites. Pollen grain analyses were done to determine pollen abortiveness that quantifies heavy metal contamination in the methods of Regis and Lagunzad (2002) and Micieta and Murin (1996). An example of the pollen grain of S. jamaicensis taken through a microscope camera is presented in Figure 3b. Crop plants were not anymore observed included in the study since these were not anymore observed in the sampling areas. Pollen grain analysis comprised of processing and counting of normal and aborted pollen grains. The former included acidifying, squashing and staining. Then, the pollen grains from the two anthers of each flower bud were counted under a compound microscope using a prepared horizontal grid placed at the back of each prepared slide. Thirty flower buds per sampling station per site were processed and their pollen grains counted. Whole plants were gathered, washed in distilled water and air-dried or oven dried at 50 – 60°C in a drying oven. Homogenization through pounding and grinding followed, then the samples were brought to the University of the Philippines Natural Science Research Institute (UPNSRI). The samples were analyzed for arsenic, cadmium and copper using Atomic Absorption Spectrophotometry (AAS). Phytoplankton study was included because there are known resistant species in acidic waters. The purpose of using the phytoplankton as indicator species was to determine species richness and the presence/absence of phytoplankton species thriving in Mogpog River compared with one of its tributaries. The phytoplankton samples were collected at Station 3 in Mogpog River and in one of the tributaries of the said river. Other stations were not included since station 1 is located at the river mouth and marine phytoplankton mixes with freshwater types. Station 2 is located at lower elevation downstream and receives several tributaries that possibly increase biodiversity. The method used for sample collection was adapted from Waterwatch (2003). The results of the study are presented in three sections: A. Soil/sediment characteristics, B. Soil pollution, and C. Effects on living organisms through indicator species. Soil/sediment characteristics have a bearing on the physico-chemical characteristic conditions of the soil and/or sediments that include acidity/alkalinity and drainage potential indicated by their color and texture. Movement of toxic heavy metals is influenced by these characteristics. Soil pH is the degree of acidity or alkalinity that measures reactivity of soil. 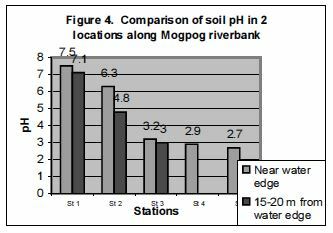 Figure 4 above shows that soils in Mogpog riverbank become more acidic from Stations 1 to 5. Also, the pH of soil is also more acidic at locations 15-20 meters from the water edge of the river than along the water edge. The increasing pH (becoming more alkaline) from Station 5 going downstream towards Station 1 is most likely due to dilution by fresh water from the different tributaries received by Mogpog River. In addition, marine contribution during high tides also increased the water pH, thus also the sediment and soil along the riverbanks. Nevertheless, this trend of decreasing pH (more acidic) from Station 1 to 5, can be attributed to acid mine drainage originating from the dam upstream. 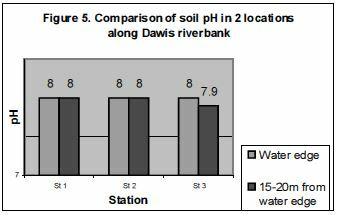 In the reference river (Figure 5), the pH of soil is alkaline which is the same in all stations for sediments near the water edge. The condition is also true for sediments obtained 15-20 meters from the water edge except in Station 3, which has a slight decreased in pH value by 0.1. Nevertheless, the value still shows alkaline condition, which is due to the presence of calcium carbonate in rocks as evidenced by the presence of remnants of fossilized corals and shells in the area. This is also confirmed by the study of Tinggay (2004) on the level of calcium in water. The slight decrease in the pH may have resulted from the presence of vegetation and decomposing plant and animal remains in the area. Decomposition of organic matter forms humic acid, a soil forming process. 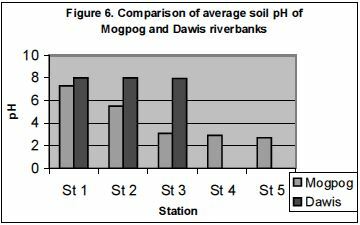 Comparing the average pH of soil in the two study sites (Figure 6), Dawis riverbank is alkaline in all station whereas Mogpog riverbank shows decreasing trend (becoming more acidic) from Station 1 to 5 towards the dam. Thus, acidity can be attributed to acid mine drainage generated in the siltation dam upstream. Soil color is the product of various chemical, biological and physical transformations that takes place within a soil. Biological processes bring about the soil organic matter or (SOM) that imparts darkening of soil color to brown and black, thus, higher the organic matter, the darker the soil. On the other hand, bright/light color indicates leaching of oxides of iron and aluminum, calcium, carbonates and/or clay minerals (Fanning and Fanning, 1989). Table 1 below compares the color of soils obtained from the study sites. In the above Table, only the riverbanks of Dawis River and in Station 1 of Mogpog River at location farther from the water edge show dark soil color. The lighter color of soil means well-drained condition. Thus, in Mogpog River, carbonates and/or clay minerals have been leached out due to the acidic condition of the soil whereas in Dawis River, the darker soil condition indicates the presence of organic matter. This condition is confirmed by the study of Tingay (2004) regarding the leaching of metals and minerals due to acid mine drainage. In his study, Calcium, Magnesium, Sulfates, Copper, Potassium, Iron and Zinc in water are high in the dam (Station 5 in this study) decreasing towards the lower elevation. The amount of sand, silt and clay in a soil provide the bases for textural classification of a soil/sediment sample (Fanning and Fanning, 1989). It can also be determined by a simple method known as Soil Texturing by Hand (DeLuca and O’Herron, 2002). Table 2 below presents the results of soil characteristics analysis of Mogpog and Dawis riverbanks.based on texture. Stations 1 and 2 of Mogpog and Station 1 to 3 of Dawis along the water edge are sandy, thus, there is high drainage potential of soils in these locations. In contrast, Stations 4 and 5 of Mogpog showed silty and clayey soils which have low drainage potential but high adsorption capacity for minerals such as heavy metals. These areas are near the tunnel below the dam and the dam itself respectively. Acidic condition tends to remobilize the heavy metals and deposit them to lower levels. This is one of the problems of acid mine drainage. Nevertheless, the best texture for a balanced water retention and drainage potential is sandy loam and loamy sand found in Dawis River at 15 –20 meters from the water edge. Fine and medium-textured soils have high retention of water and exchangeable nutrients. Coarse-textured soils (large soil fragments) however have large pores, thus, percolation is high because they have very weak water-holding capacity. Thus, this type of soil have low water retention due to their rapid infiltration rates. On the other hand, when pores are fine, water is strongly adsorbed by forces that exceed gravity (Fanning and Fanning, 1989). Because it is retained in the soil, water becomes unavailable to plants. Medium-sized pores however have high water availability. In addition, the adsorption of cations (nutrients) and microbial activities are also dependent on surface area of soils. Annex 2 shows the level of heavy metals in soil/sediment samples obtained from various stations at the banks of Mogpog River, the tunnel and the dam. These results are presented in bar graphs in Figures 7 through 12. Reference standards are also presented in Annex 3. 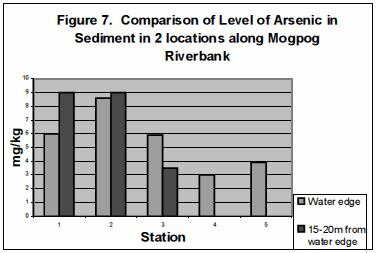 In the above Figure, Stations 1 and 2 of Mogpog River show higher values of arsenic in sampling stations located away from the water edge. Lower value is however shown in station 3 at this location. At the water edge, only station 2 recorded higher value than the other stations. It is possible that arsenic is deposited in this station due to its lower elevation than stations 3 to 5. The higher value in Station 2 at the water edge may be due to contribution from other sources. In station 1, the lower value at the water edge may have been due to sediment deposited from the marine environment. From stations 4 going downstream, acidic water and soil might have remobilized the arsenic and deposited it at lower elevation. Arsenic in sediments at location farther from the water edge, also increases going downstream. This may be due to higher pH which is alkaline that decreases remobilization of heavy metals. water medium caused some of the metal to be released into the air. However, from stations 4 to 2 towards the coast, there seems to be a gradual deposition of arsenic. Another source of arsenic may be human activities such as the use of pesticides in farms and other sources due to the presence of human communities in stations 1 to 3. Nevertheless, the trend between Stations 4 and 5 shows that the source of arsenic is the dam upstream. 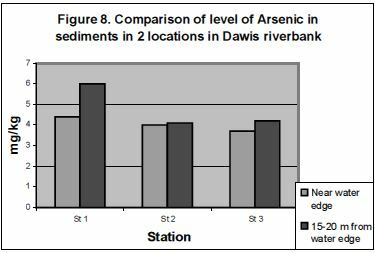 In Dawis river, the trend among the stations, show higher arsenic level at locations away from the water edge. This shows that arsenic tend to remain in the same location. Since the pH of soil is alkaline, there is less remobilization of arsenic in this location, hence, arsenic content in sediments are higher at locations away from the water edge. The higher level of soil arsenic in station 1 can also be due to other factors such as human activities that use products containing arsenic. At the water edge, the increasing trend towards the coast shows that arsenic is being carried by the acidic river downstream and deposited there. Nevertheless, the values are much lower than the critical values for arsenic which is 20 mg/kg. 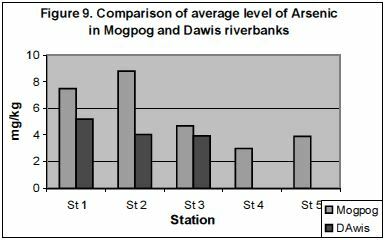 In comparing the two rivers, Mogpog riverbank has higher average content of arsenic than Dawis riverbank. The trend shows increasing level of arsenic towards the coast due to deposition of the metal downstream. The exception is Station 5 of Mogpog which is the dam and the most likely source of arsenic. Very high level of lead was recorded for soils in Station1 of Mogpog River. There is also an increasing trend of the level of lead in soils from Stations 2 to 5 near the water edge and Stations 1 to 3 at 15 –20 m from the water edge. This shows that the source of lead comes from the dam upstream. Higher content of lead in Station 3 at location farther from the water edge than at the water edge indicates that lead is slowly being deposited in this area. because aside from the contribution from the siltation dam, the high level of lead in Station 1 near the water edge may be due to human activities that use lead such as fuel used in vehicles including motorized boats since this station is along the mouth of the river. True trend of values is shown in sediments at location away from the riverbank wherein deposition is less influenced by water contaminated with lead coming from anthropogenic activities. Dawis riverbank also shows the same trend as Mogpog River. There is higher level in Station 1 than the other stations and increasing level of lead from Station 2 to 3, which is going upstream in both locations – near the water edge and at 15-20 m away from the water edge. The high level of lead in Station 1 may be due to anthropogenic sources. 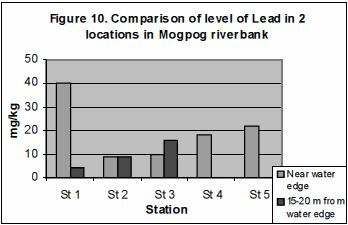 Nevertheless, the level of lead in the reference river is much lower than Mogpog river. 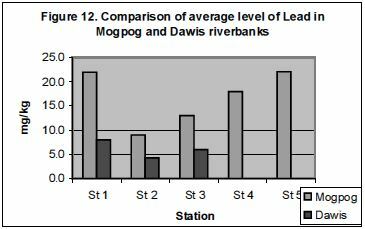 Figure 12 compares the average level of lead in soil along Mogpog and Dawis riverbanks. 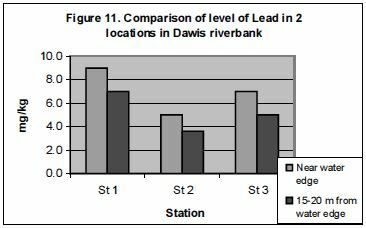 The results show trend of increasing levels of lead from downstream to upstream in the dam except for Station 1. Nevertheless, the trend shows that although lead is naturally occurring in the area, its higher values in Mogpog means that lead content of sediments have been remobilized by acidic water due to mining activities. Although cadmium was also measured in soil samples, its level is below the detection limit of the analytical laboratory (Annex 2). Water quality assessment by Tingay (2004) shows very low level of cadmium in water in the dam, at the tunnel below the dam and some stations downstream. Thus, adsorption in soil particles is also low. Nevertheless, there is a decreasing level of cadmium in water from the tunnel below the dam towards station 3 downstream and this indicates mobilization of cadmium due to the acidic water which may in time, cause increased adsorption by soil particles enough to be detected later on. When a certain living organism responds to a particular environmental condition, it is known as a biological indicator or bioindicator. Kovacs (1992) listed several factors that elicit such responses and these are: a) genetic make-up, b) stage of development, c) changes in environmental conditions, and d) concentration of pollutants. response to exposure to the pollutant. The second indicators are the phytoplankton (Kovacs, 1992) because they are able to provide qualitative response to changes in environmental conditions. Pollen grain abortion above the natural abortive tendency of plants indicates impact on the capacity of plants to produce fruits and for self-perpetuation. Table 3 and Figures 13 and 14 below prove the effects of heavy metals on plant productivity. In terms of percent pollen grain abortion, Site 1 (Mogpog) has higher percentage of aborting pollen grains than Site 2 (Dawis) in all stations. ANOVA confirmed the significant differences in pollen grain abortion between Mogpog and Dawis study sites. In the former, Station 2 has lower mean pollen abortion than Stations 1 and 3 which are the mouth (connected to the sea) and upstream (nearer the dam) respectively. As noted in the soil analysis, Station 1 may be influenced by other factors that originate from human settlements, thus, this station receives additional amounts of heavy metals such as lead from vehicular sources causing an increase in pollen abortion. Nevertheless, Stations 2 and 3 of Mogpog river shows an increasing trend towards upstream in pollen abortiveness. Figure 13 below presents various examples of aborted pollen grains of S. jamaicensis in the study sites. The following Figures 14 to 19 also categorized the pollen abortiveness by groups according to a range in pollen abortion. This is a graphical presentation of the trend of pollen abortion in the indicator species found in both sites and in all stations. In each station, 30 flower buds were processed and counted. Figures 14 to 16 present the results from Mogpog River. In Station 2 of Mogpog, the above figure shows a shift in the increase in pollen abortion towards a higher range (5.1% to 10%) which is above the natural pollen abortiveness. Lower category (% at natural level) also decreased. There is also a decreased towards the higher category. This findings indicate increase in the level of heavy metal contaminant, thus, higher percent pollen abortion. In Figure 16, Station 3 of Mogpog River shows highest pollen abortiveness at category 2 (5.1-15%) which is above the natural pollen grain abortiveness. Natural pollen abortiveness has decreased further. Note that Station 3 is located at higher elevation and nearest the Maguila-guila dam which is the source of the contaminant of Mogpog River. Figures 17 to 19 presents the results from Dawis River, the reference/control site. have been concentrated here by clay particles in a predominantly sandy soil in this site. could have contributed to heavy metal pollution. On the other hand, Figure 19, Station 3, shows that pollen abortion is mostly within the natural abortive range. Very few flower buds exhibited higher than natural and the values were not so high. The sampling area is in a peaceful place with crystal clear water flowing and not much disturbance from human activities. Farmlands are higher in elevation and mostly composed of coconut trees. The levels of arsenic, cadmium and copper in the indicator species Stachytarpheta jamaicensis are presented in Table 4 below. The results of the chemical analyses done by the Natural Science Research Institute (NSRI) of the University of the Philippines are presented in Annexes 4a and 4b. The above results show that the levels of arsenic, cadmium and copper are higher in samples taken from Mogpog River than those taken from Dawis River, the reference site. Among the three metals, cadmium in Mogpog was detected higher than the natural content and only slightly higher in Dawis. Nevertheless, all results show lower than the critical level in plants based on Pfeiffer et al. (1988). likely due to acid mine drainage. River ecosystems upstream normally have very low diversity and abundance of phytoplankton. Exception to this is when the section of the river is relatively flat thereby allowing settlements of organic matter coming from plants and animals that provide algal nutrients for phytoplankton growth. Another source of algal nutrients is the existence of many human settlements along the riverbanks. In mining areas with sulfide ores, a group known as cyanophyta or cyanobacteria includes species known to use sulfur for metabolic functions even in low level oxygen or its absence. These species are termed as chemolithautotrophic (Gray and Head, 1999). Species richness of phytoplankton recorded for Mogpog River and one of its tributary are recorded as 29 and 31 species respectively. Annex 6 presents the various species and compares the phytoplankton diversity between Mogpog River and one of its tributaries in Station 3, Bocboc Area. The results show that there is not much difference in species richness between an acidic river (Mogpog) and its tributary. The only difference lies on the kind of species present in the sites. There are 12 species that are exclusively found in Mogpog River and 14 species found only in the tributary. Since the samples were collected from the mouth of this tributary, it is expected that the species in the tributary will be carried by the water current to Mogpog River. In undisturbed state, such species would survive. However, disturbance in the river such as in acidic condition, intolerant species was not be able to survive. These findings therefore show the destructive nature of acid water on biodiversity by replacement of species and or disappearance of species. In aquatic ecosystems, phytoplankton are also considered the base of the food chain. Heavy metals are naturally occurring in Marinduque. Nevertheless, in areas with no mining activities and river water is not acidic, heavy metals are not remobilized from its source (the highly mineralized area) to lower slopes. The naturally occurring heavy metals are also found in small quantities in soil at the upper layers within the tolerable level of plants and animals. FeSO 4 is the one responsible for the red-orange precipitate that coats rocks and sediments in a river. The resulting sulfuric acid (H 2 SO 4 ) is the substance that causes the leaching of heavy metals to the surroundings and creating a very low pH in water and soil such as what happened in Mogpog River. The process is hastened by sulfur bacteria such as Thiobacillus thiooxidans and Thiobacillus ferrooxidans through bacterial oxidation processes (Allan, 1988 in Salomons et al., 1995). water edge. Lead is highest at the source decreasing downslope except at the lowest elevation which is affected by human activities. Hence, such deposition will continue to impact living organisms within the vicinity of the river as well as agricultural productivity downslope. b) the levels of arsenic, cadmium and copper in indicator plants are higher in Mogpog River than those from Dawis River. Cadmium was also found to exceed the natural content in plants in Mogpog river. 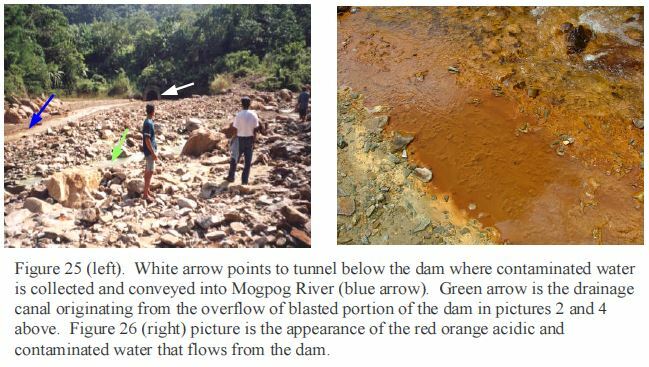 c) acid mine drainage caused the leaching and remobilization of heavy metals from the dam to riverbanks in the lower slopes. Heavy metals cause a variety of physiological abnormalities in many plants. One of these is the reduction in the uptake of water by the plants due to copper toxicity (Panou-Filotheou et al., 2001). The consequence of this is decrease rate of transpiration due to the following effects of copper and other heavy metals: a) reduction in the transpiring surface area Lanaras, et al., 1988, Barcelo and Poschenrieder, 1990; b) cadmium in bush bean caused reduction in the mesophyll intercellular spaces resulting in less water diffusing to the stomata (Barcelo et al., 1988). Leaf chlorosis is also associated with changes in structure and physiology in chloroplasts such as reduction in the volume and number of mesophyll chloroplasts (Panou-Filotheou et al., 2001; Ouzounidou et al., 1992). The shape of chloroplast is also affected by cadmium (Barcelo et al., 1988; Ouzounidou et al., 1997) and lead (Heumann, 1987). Heavy metals such as cadmium also cause loss of starch grains in chloroplast. Copper toxicity damages the chloroplast limiting membrane (Taylor, 1988). In all the above observations, the ultimate impacts of heavy metal toxicity results to reduction in the capacity to produce food by photosynthesis by plants. Thus, in soils laden with heavy metals, plant productivity suffers so that crop production becomes low. This is the reason perhaps why in mining areas, plant growth is reduced, some plants do not thrive and only a limited number of species (only the tolerant ones) survive. Based on the reports of the US Agency for Toxic Substances and Disease Registry, arsenic is known to cause cancer that attacks the lungs, skin, liver, kidney, bladder and other organs of the body. Its entry into the human body is through contaminated drinking water and by ingestion of contaminated food. It passes out slowly through hairs and nails. The inorganic form of arsenic in food and water is more problematic because it is also a human poison, fatal at concentration of 60 parts per million (ppm) because it damages the nerves, stomach intestines and skin. It can also decrease production of the red and white blood cells and its known to induce abnormal heart rhythm. (http://www.environment.about.com/library/weekly/blchem.htm?terms=arsenic; Arsenic Project, http://www.hvr.se/nov97/arsenic.html). In combination with other factors, such as malnutrition and Hepatits B of affected person, the effects of arsenic poisoning becomes worse (The World Health Organization [WHO], http://www.who.int/inf fs/en/fact210.html). This metal has no known biological function, yet, it is readily absorbed by plants through the root pathway which eventually reach the leaves, fruits and seeds (Johnson, BT., 1997, http://ace.orst.edu/info/extonet/faqs/foodcon/cadmium.htm). Humans become contaminated through ingestion of contaminated food. In humans, cadmium has a tendency for chronic accumulation in the kidneys wherein, at 200 mg/kg fresh weight concentration in the kidney cortex, causes kidney dysfunction (Alloway, 1995). Likewise, it is also deposited in liver. In the blood, cadmium binds to the erythrocytes (red blood cells). Since cadmium in the body is eliminated slowly due to its biological half-life which is 10-30 years), its impact on the body is metabolic dysfunction of organs affected. Diet that are low in calcium, iron or protein enhance the absorption of cadmium in the body. Lead contamination is brought about by inhalation of contaminated dust particles in the air and by ingestion of contaminated food. Once it enters the body, it affects the organ system especially the central nervous system. In children, it has been reported to cause permanent developmental problems at low dose. At higher concentration, lead could interfere with the formation of red blood cells in humans as well as cause neurological disorder. Other diseases associated with lead include anemia, learning difficulty, decreased mental ability, and damages to the kidney and immune system (Northwestern University, http://www.chem.northwestern.edu/~hagodwin/toxicity.html; US Agency for Toxic Substances and Diseases Registry, http://www.environment.about.com/library/weekly/blchem2.chtm). Copper is a trace element essential for human health. However, too much copper also cause health problems. When there is high copper in the air at the workplace, people suffer from metal fever that manifest as flu-like (http://www.lenntech.com/Periodic-chart-elements/Cuen.htm). In addition, long-term exposure can cause irritation of nose, mouth and eyes, suspected to result to lowered intelligence in adolescents. Headaches, stomachaches, dizziness, vomiting and diarrhea are also experienced. High uptakes of copper may cause liver and kidney damage, hepatic cirrhosis, brain damage, renal disease and copper deposition in the cornea of the eyes. The reality of the above findings can be explained by the geochemical-physical condition of the island of Marinduque. These are: a) Presence of sulfide rocks capable of generating acid in the presence of oxygen and water. This is a natural process that last for hundred of years until the sulfide rocks in the area have been dissolved. Since sulfide rocks contain other heavy metals aside from copper in this case, the acid will remobilize the heavy metals and deposit them in soil particles; b) Steep slope, so that even in Type III climate, rainwater facilitates the movement of contaminated water and erosion of sediments during the rainy season. Type III climate is described by PAGASA as having “seasons not very pronounced, relatively dry from November to April and wet for the rest of the year”. c) Marinduque is a small island ecosystem with steep slope so that pollutants such as those coming from tailings dump of the mines can easily be carried by runoff, river water, and flood water into the marine environment thereby affecting the fishery resources. The danger to humans becomes highly probable because some plants are able to tolerate relatively high concentration of heavy metals. Some animals are also able to accumulate heavy metals in their tissues without causing immediate death. Thus, these realities pose danger to the unsuspecting persons because heavy metals can be transferred from soil to plants, then to animals and eventually to humans. 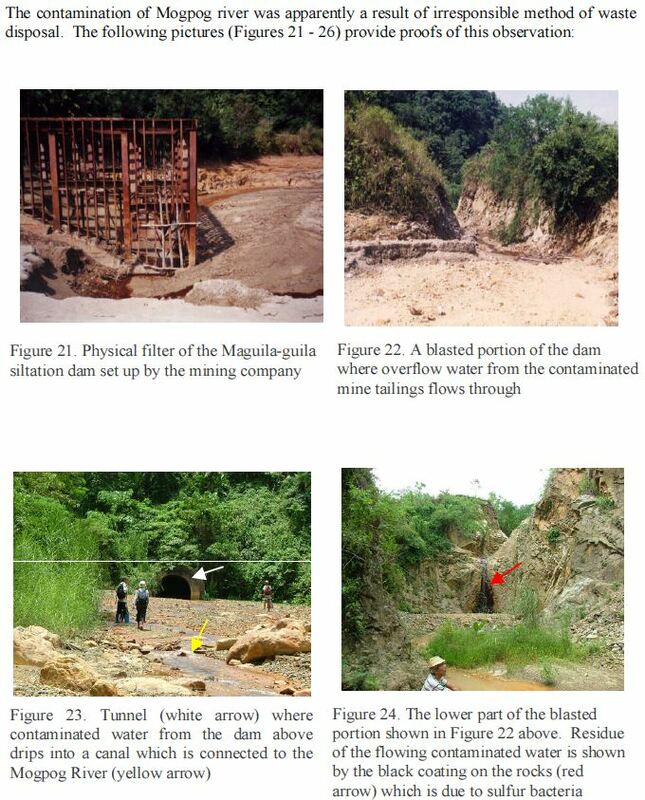 The apparent use of Mogpog River as a disposal site for the acidic liquid of the mine tailings caused the contamination of the soil along the riverbank and its vegetation. The acid generated through the process of acid mine drainage leached out the heavy metals from the waste rocks of the mines and tailings deposited in the siltation dams. Such heavy metals are carried by the acidic water and deposited to the soil and sediments and are also carried downstream where they accumulate in the lower portion of the river. The deposition of heavy metals in the soil resulted in their entry to the plant bodies and affected the productivity of plants. Moreover, the acid and the toxic metals killed most of the aquatic organisms except some tolerant species of phytoplankton. phenomenon of Acid Mine Drainage (AMD). In the report of Dr. Alan Tingay (2004), heavy metals in Mogpog river such as cadmium, copper, iron, and zinc show trends of decreasing level from the dam upstream to the coast downstream indicating that heavy metals originated from the mine. The values are also higher in this river than in the reference river (Dawis River). is collected and conveyed into Mogpog River (blue arrow). Green arrow is the drainage canal originating from the overflow of blasted portion of the dam in pictures 2 and 4 above. Figure 26 (right) picture is the appearance of the red orange acidic and contaminated water that flows from the dam. also detected in the dam upstream and in other areas downstream with levels higher than the reference river. The deposition of lead and arsenic is also occurring in areas farther from the water edge. The same occurrence is probably happening with other heavy metals such as copper and zinc since elevated levels of these metals in water were reported in the study of Tinggay (2004) in the same river. Microorganisms in soils are ecologically important because they are involved in energy flow and geochemical cycling of nutrients. Among the functions of these organisms in soil, the decomposition of plant and animal tissues is the most important because their activities return nutrients to the soil. Once degraded, the released minerals are taken up by plants and later, by consumer animals through the food chain. In the case of phytoplankton, changing conditions in a river could cause a change in diversity of organisms. Since phytoplankton are also at the base of the food chain in aquatic habitats, this kind of change in diversity would influence the kind of organism that could thrive in the water even if acidity has been reduced as in Station 2 of Mogpog River. In this river, there are also species that thrive at the mouth of a tributary (non-acidic freshwater), yet were not found in the receiving acidic water of Mogpog. This confirms the destructive nature of acid mine drainage to aquatic plants in disturbed rivers. Aside from phytoplankton, acid mine drainage kills microorganisms except those that are resistant to acid. These resistant strains however such as sulfur bacteria may continue to thrive in the soil in the absence of other living organisms as food source and survive by using sulfur and other minerals for metabolic activities. Such bacteria are also capable of methylating heavy metals. This kind of transformation makes methylated heavy metals to become soluble in water thereby facilitating their entry into living cells (Jackson and Jackson, 1996). Once the methylated metals are inside the organism’s body, they are able to create a variety of metabolic disorders. The effects of heavy metal pollution on higher plants are associated with agricultural productivity. For instance, the phytotoxic effects of arsenic include: sudden decrease in water mobility as shown by root plasmolysis, necrosis of leaf tips and margins, and halting seed germination (Alloway, 1995). The danger of arsenic contamination in areas affected by AMD is that its toxicity on plants increases as the soil becomes more acidic. 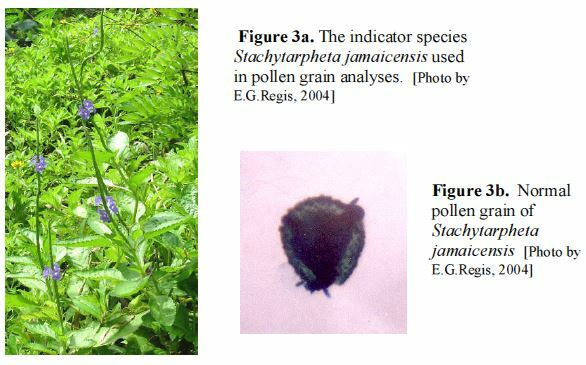 Another effect is shown in the present study by the indicator species Stachytarpheta jamaicensis, that heavy metals cause abortion of its pollen grains (see Figure 17). This kind of disturbance is a problem in crop production. Pollen grains are plant structures that house the male gametophyte (sperm cells) of flowering plants and Gymnosperms. In order that they can fertilize the female gametophyte (egg cell) of a flower, pollen grains must have tough, resistant walls and must be produced in large numbers to facilitate finding their specific targets during pollination (Moore et al., 1991). Reduction in number of viable pollen grains decreases chances of pollination, consequently reduces the capability of plants to develop fruits and seeds to continue their generation. This is one of the reasons why heavy metal pollution causes decrease in productivity of agricultural land. areas” provided evidences of pollen grain abortion of crop plants such as rice through experimentation (Maranan and Valisto, 2003). In mining areas in Jose Panganiban, Province of Camarines Norte, there are also mature coconut trees that do not bear fruits. These examples show that the impact of mining on terrestrial plants reflect problems in agricultural productivity. Moreover, the impacts of acid mine drainage (AMD) are not confined to the water in a river. The riparian zone along the riverbanks are unique habitats for plants and animals. Acidic water seriously affects such habitats in terms of heavy metals deposition especially in areas with clay particles. The resulting contamination of soil with metal-rich acidic water would not only kill soil fauna and microorganisms but would have a detrimental effect on fruit bearing plants cultivated by the people. If, before mining was conducted in Marinduque, the riparian habitat was a source of fertile soil and sufficient supply of fresh water for raising short term crops, after mining, the destruction of the river by AMD deposits toxic heavy metals and prevents the use of such water for the same purpose. For instance, copper can be absorbed by plants through active and passive transports (Kabata-Pendias and Pendias, 1984). In passive absorption, the metal in solution may be more likely within the toxic range. Excess copper causes the following physiological problems in plants: 1) tissue damage and elongation of root cells; 2) permeability of cell member becomes altered causing leakage of ions such s potassium and phosporus in roots; and 3) inhibition of photosynthesis. Downstream, even with a reduced acidity, high levels of heavy metals have been deposited since they are also detected at lower elevation and near the coast. 2. The increased level of heavy metal pollution in soil and plants may reach above the critical range. This situation will be brought about by continuous deposition of the pollutants through water transport downstream where human settlements are concentrated, by wind as dust during the drier months, or by horizontal movement of the metals from the water edge spreading inward in the riparian zone where people plant their crops. 3. Reduction in agricultural productivity due to toxic effects of heavy metals in soil and plants. This event will likely occur because of increasing acidity of soil from the water edge towards the riparian zone. Similarly, the increasing acidity will kill soil organisms (micro and macro) that are responsible for facilitating the release of nutrients from organic matter in the soil. 4. Reduction in the productivity of fishing grounds within the vicinity of the outfall of Mogpog River. Siltation is the major hazard that will cause fish kills by burial or choking of aquatic organisms. Toxic level of heavy metal will finish off the rest of the organisms that survived siltation and those that happen to visit the place. 5. Heavy metals in fishery resources will spread to other marine organisms via the food chain. In time, major fishery resources will accumulate toxic metals in their bodies and can also reach man through the food chain pathway. the sulfur of the protein cysteine, a natural constituent of the body (Fergusson, 1990). Although naturally low in concentration, Cadmium may pose another serious health problem because it is absorbed readily but is eliminated slowly in the body (Agency for Toxic Substances and Disease Registry Division of Toxicology, 1999). Other observations in Mogpog river system show that silt and deposition of tailings coming from the dam will continue to happen during heavy rainfall due to the huge volume of tailings that have accumulated and continually fill up the Maguila-guila dam. Acid mine drainage (AMD) that is brought about by natural processes in the siltation dam, a waste dump of Placer Dome-Marcopper Mines, is the most possible cause of pollution and destruction not only of the river water in Mogpog, but also of the soils in the riparian habitats in the riverbank. Heavy metals leached out by AMD also caused loss of productivity of plants through pollen grain abortion. It also altered the plankton composition of the river. Acid water leached out heavy metals from the dam and deposited them into the lower reaches of Mogpog River. This fact cannot be denied because wastewater that drips into the tunnel below the Maguila-guila siltation dam and those that overflows from the siltation dam have been channeled into Mogpog River for disposal as well as to ease pressure build-up from the dam especially during the rainy season. Thus, heavy metals will continue to accumulate in the river ecosystem unless remediation can successfully be implemented. To date however, there is still no remediation of AMD under the present technology. All recommendations are still based on experimental procedures and no success stories have been shown under actual field condition in affected mine sites in tropical countries like the Philippines. In addition experimental remediation have not included the impacts on human communities in terms of health and sustainable livelihood not connected with mining activities. The future scenario therefore is bleak for the people of Mogpog and other villages that settled along the riparian zone of the river unless rehabilitation of the river to its productive condition can by done by the company responsible for this mining disaster. With the destruction of the Mogpog River ecosystem, and the impending disaster that looms ahead from the huge amount of tailings still waiting to go down from the waste dumps in the mining area, no amount of money can compensate for the ecosystem destruction brought about by irresponsible mining and what the people will endure for a long long time. A & S R Tingay, 2004. Water Quality in the Mogpog River, Marinduque Island, Republic of the Philippines, Oxfam Australia. Allan, Rod. 1988. Impact of mining activities on the terrestrial and aquatic environment with emphasis on mitigation and remedial measures. In Salomons, Wim, Ulrich Förstner, and Pavel Mader. Barcelo, J. MD Vazquez, and C. Poschenrieder. 1988. Structural and ultrastructural disorders in cadmium-treated bush bean plants (Phaseolus vulgaris L.) New Phytologist. 108:37-49. Barcelo, J. and C. Poschenrieder. 1990. Plant water relations as affected by heavy metal stress: A review. Journal of Plant Nutrition. 13: 1-37. Coumans, Catherine and Geoff Nettleton. 2000. The Philippines: Centuries of Mining. Forest Peoples Programme, Philippine Indigenous Peoples Links and World Rainforest Movement. 2000. January. Undermining the Forest. Published by Netherlands Committee for IUCN, The World Conservation Union pp. 56-70. DeLuca, T.H. and M.P. O’Herron, 2002. Introductory Soil Science Laboratory Book. 6th Ed. School of Forestry, University of Montana, Missoula, MT. Gray, N.D. and I.M. Head. 1999. New insights on old bacteria: diversity and function of morphologically conspicuous sulfur bacteria in aquatic systems. Hydrobiologia. May, 1999. Vol. 401, No. Heckman, Joseph R. 2003. Soil pH Measurement with a Portable Meter. Rutgers Cooperativer Extension Fact Sheet. New Jersey Agricultural Experiment Station. The State University of Rutgers. Heumann, HG. 1987. Effects of heavy metals on growth and ultrastructure of Chara vulgaris. Protoplasma. 136: 37-48.
growing on ore bodies enriched in Cu. Physiologia Plantarum. 88:307-314. Langdon CJ. Piearce TG, Black S, Semple KT. 1999. Resistance to arsenic toxicity in a population of the earthworm Lumbricus rubellus. Soil Biology and Biochemistry. 31(14):1963-1967. Maranan, Mon and Debra Valisto. 2003. Pollen grain abortiveness of rice (Oryza sativa) and mungo (Vigna radiata) Undergraduate Thesis for the degree of BS Biology. Moore, P.D., J.A. Webb and M.E. Collinson 1991 Pollen Analysis 2nd edition Blackwell Scientific Publication. O’Neill, P. Arsenic. In Alloway, B.J. 1995. Heavy metals in soils. 2nd edition. Blackie Academic & Professional. Chapman & H all. London. pp. 105 –116. Ouzounidou, G., EP Eleftheriou, and S. Karataglis. 1992. Ecophysiological and ultrastructral effects of copper in plants. Oxfam Australia. 2005. Mogpog in Mining Ombudsman Case Report: Marinduque Island. Oregano (Origanum vulgare subsp. hirtum). Annals of Botany. 88:207-214.
rice cultivation provinces in Luzon, Philippines. Hamburger Bodenkundliche Arbeiter. Philippines: Observations from a Joint U.S. Geological Survey — Armed Forces Institute of Pathology Reconnaissance Field Evaluation, May 12-19, 2000. USGS Open File Report 00-397. Regis, Emelina. 2004. Gold mining as cause of poverty of local communities in gold mining areas. Gibon, Journal of Ateneo de Naga University, Naga City. Vol. IV. NO. 1: pp 81 – 146. Regis, Emelina. 2002. Report on the Initial Visit Conducted by INECAR in Mogpog River Affected by Marcopper Mining. INECAR, Ateneo de Naga University, Naga City. Naga University, Naga City. Vol 1, pp. 43 –77. Science, University of the Philippines, Diliman, Quezon City. Ripley, Earle A., Robert E. Redmann and Adèle A. Crowder. 1996. Environmental Effects of Mining. St. Lucie Press. Delray Beach, FL., USA. pp. 150-151; 167-170; 186-191. Vugteveeen, Rob. Asarco Ray Mine. http://www.elmshurst.edu/~chm/vchembook/334raymine.html Date retrieved: Jan, 2005. Waterwatch. Algae. http://www.vic.waterwatch.org.au/fortheteacher/manual/sect3e.htm. Date retrieved: Nov. 29, 2003. Safety. Vol. 48, No. 1 pp. 51-58. January 1, 2001.